Anoplolepis gracilipes (so called because of their frenetic movements) have invaded native ecosystems and caused environmental damage from Hawaii to the Seychelles and Zanzibar. On Christmas Island in the Indian Ocean, they have formed multi-queen supercolonies. They are also decimating the red land crab (Gecarcoidea natalis) populations. Crazy ants also prey on, or interfere in, the reproduction of a variety of arthropods, reptiles, birds and mammals on the forest floor and canopy. Their ability to farm and protect sap-sucking scale insects, which damage the forest canopy on Christmas Island, is one of their more surprising attributes. Although less than 5% of the rainforest on Christmas Island has been invaded so far, scientists are concerned that endangered birds such as the Abbott’s booby (Sula abbotti), which nests nowhere else in the world, could eventually be driven to extinction through habitat alteration and direct attack by the ants. Anoplolepis gracilipes is one of the largest invasive ants and are typically small to medium-sized and range from 1-2mm, like Wasmannia auropunctata, to more than 5mm (Holway et al. 2002). The ant, also known as the long-legged ant, is notable for its remarkably long legs and antennae. A. gracilipes workers are monomorphic, displaying no physical differentiation (Holway et al. 2002). It has a yellow-brownish body colour, and is weakly sclerotized. Workers have a long slender gracile body, with the gaster usually darker than the head and thorax. It may subdue or kill invertebrate prey or small vertebrates by spraying formic acid. Please click on AntWeb: Anoplolepis gracilipes for more images and assistance with identification. The AntWeb image comparison tool lets you compare images of ants at the subfamily, genus, species or specimen level. You may also specify which types of images you would like to compare: head, profile, dorsal, or label. 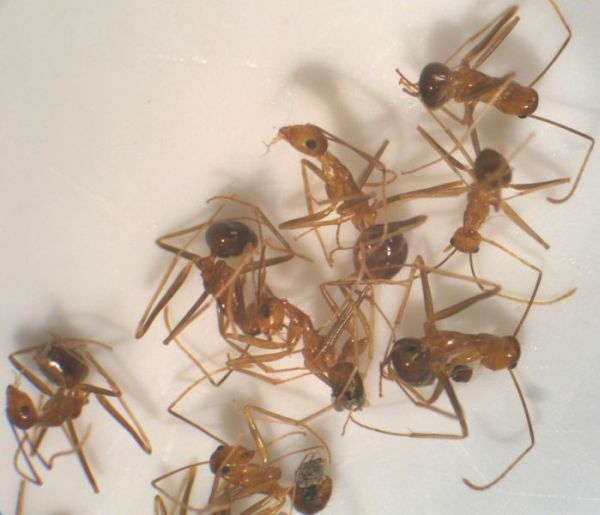 Please see PaDIL (Pests and Diseases Image Library) Species Content Page Ants: Yellow crazy ant for high quality diagnostic and overview images. Foraging Behaviour: Although the yellow crazy ant (Anoplolepis gracilipes) typically nests under leaf litter or in holes in the ground, it forages extremely competitively over every surface within its territory, including forests trees (Room 1975, in O’Dowd et al. 1999). Its ability to forage throughout the day and night, and over a wide range of temperatures allows it to rapidly alter invaded ecosystems. High temperatures (such as those that occur around midday) and surface ground temperatures of 44°C may prevent workers from foraging. Ant activity begins to decline from around 25°C and foraging may be limited by rain. Researchers have reported an increase in both foraging activity and nest size in the dry season. It exhibits frenetic behaviour when its foraging is disturbed, which presumably explains its common name. 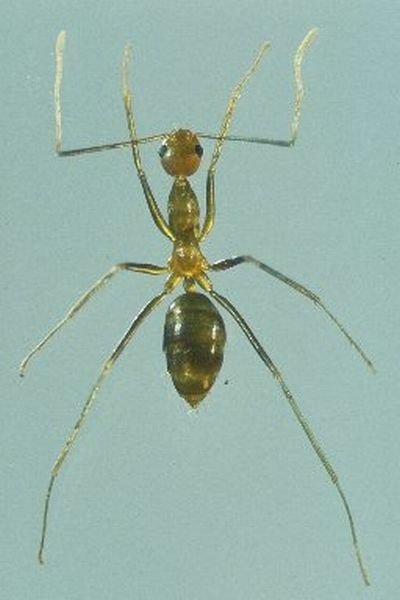 Note that it should not to be confused with the similarly named crazy ant (Paratrechina longicornis) and that most literature on A. gracilipes is under its synonym (A. longipes). The life cycle of Anoplolepis gracilipes has been estimated to take 76-84 days. Eggs hatch in 18-20 days, and worker larvae develop in 16-20 days. Pupae of workers require around 20 days to develop while those of queens develop in 30-34 days. Anoplolepis gracilipes are known to be ready invaders of disturbed habitats such as urban areas, forest edges or agricultural fields (Ness and Bronstein, 2004). The ability of A. gracilipes to live in human dwellings or human-frequented areas has meant it has become a serious pest in many households and buildings (O’Dowd et al. 1999). The yellow crazy ant has been known to successfully colonise a variety of agricultural systems, including cinnamon, citrus and coffee crops and coconut plantations (Haines and Haines 1978, Van Der Goot 1916, in Holway et al. 2002; O’Dowd et al. 1999) and on banana, rambutan, mango, durian, sugarcane and langsat (Jochen Drescher pers.comm May 2010) . In agricultural regions it is typically found nesting at the base, or even in the crown, of crop plants. For example, on New Guinea it nests in the crowns of coconut trees, feeding off honeydew-producing scale insects and palm flower nectar (Young 1996, in O’Dowd et al. 1999). A. gracilipes is also capable of invading undisturbed habitats as in the case of the drier monsoon forests on Christmas Island (Indian Ocean), where the yellow crazy ant experienced a population explosion and thrives in (previously) undisturbed native forest habitats (CBD, 2003); it is however not known to enter lowland rainforest or submontane rainforest (Jochen Drescher pers.comm May 2010). The nesting requirements of the ant are general and it often nests under leaf litter or in cracks and crevices (Lewis et al. 1976, Rao and Veeresh 1991, in O’Dowd et al. 1999). On Christmas Island, the yellow crazy ant takes advantage of crab burrows, the woody debris of the forest floor, tree hollows and epiphytes and the hollows created at the base of palm leaves (O’Dowd et al. 1999). Anoplolepis gracilipes colonies are polygynous. Worker production fluctuates but is continuous throughout the year. Sexual offspring may occur year-round, but are generally produced seasonally (prior to the rainy season) (Baker 1976, in O’Dowd et al. 1999). Colony budding is an important form of dispersal for the ant, although winged queens and males (known as alates) have been reported on Christmas Island. It is unclear if winged-forms of the ant are able to start new colonies. 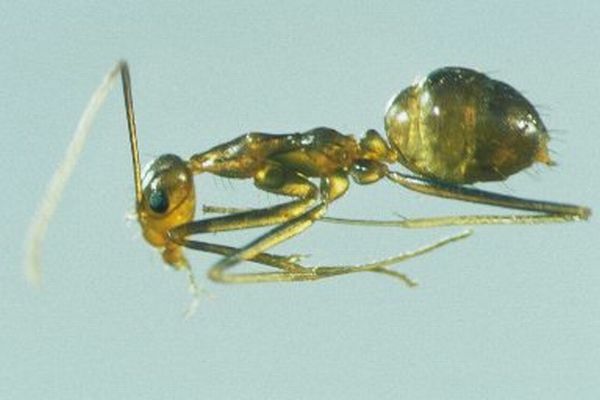 Anoplolepis gracilipes have a broad diet characteristic of many invasive ants. A generalised feeding regime increases the invasiveness of an ant due to the increased ability to gain nutrition from available resources including grains, seeds, arthropods, decaying matter and vegetation (Holway et al. 2002; Ness and Bronstein 2004). The yellow crazy ant is a scavenger and preys on a variety of litter and canopy invertebrates, such as small isopods, myriapods, molluscs, arachnids, land crabs and insects (O’Dowd et al. 1999). In the Seychelles, they feed on invertebrates and will attack, kill, and dismember large arthropods (Haines et al. 1994, in O’Dowd et al. 1999). Like all ants, they require proteinaceous foods for brood production (O’Dowd et al. 1999). In addition to protein-rich foods A. gracilipes may rely heavily on carbohydrate-rich nutrient sources, such as plant nectar or honeydew-producing scale insects (especially insects in the Homoptera genus). In the Seychelles, the quantity of honeydew in a 2.5mg worker is estimated to be up to 50% (Haines et al. 1994 in O’Dowd et al. 1999). The presence of Homoptera insects may be so important that it may limit population growth. For example, in cocoa plantations in Papua New Guinea Homoptera insect populations are thought to be necessary to support and sustain A. gracilipes colonies (Holway et al. 2002). Transported in road vehicles, machinery, boats, and aircraft.Transported in packaging material, timber.Translocated in soil, produce and timber.Transported in soil and produce.Transported in soil, packaging materials, pallets.Deliberate introductions for biological control of plant pests on coconut, coffee and cacao plantations.Transported in goods, packaging, pallets in container. Anoplolepis gracilipes has entered Australian ports in sea cargo containers in Cairns and Brisbane, Queensland, Australia and been intercepted in Fremantle, Western Australia.Translocated in soil, produce and timber.Transported in soil, packaging materials, pallets. Recommended citation: Global Invasive Species Database (2019) Species profile: Anoplolepis gracilipes. Downloaded from http://www.iucngisd.org/gisd/species.php?sc=110 on 22-04-2019. High densities of the yellow crazy ant (Anoplolepis gracilipes) have the potential to devastate native 'keystone'\r\nspecies, resulting in a rapid alteration of ecosystem processes and negative effects on\r\nendemic species. The most notable example concerns the native forests of Christmas\r\nIsland, in which populations of the yellow crazy ant have exploded in recent decades (at\r\nleast 60 years after its initial introduction) (CBD 2003). Please follow this link for more details on the impacts of yellow crazy ants on biodiversity. For a summary of the general impacts of invasive ants, such as their affect on mutualistic relations, the competitive pressure they impose on native ants and the effect they may have on vulnerable ecosystems please read this document: invasive ants impacts compiled by the ISSG. Preventative measures: The Pacific Ant Prevention Programme is a proposal prepared for the Pacific Plant Protection Organisation and Regional Technical Meeting for Plant Protection. This plan aims to prevent the red imported fire ant and other invasive ant species from establishing within or spreading between countries in the Pacific. Chemical: The toxic principles in ant baits include the so-called “stomach” poisons, hydramethylnon (Maxforce, Amdro), sulfuramid and sodium tetraborate decahydrate (Borax). Insect Growth Regulators (IGRs) disrupt development and include compounds such as methoprene and fenoxycarb. Stomach poisons work relatively fast compared to IGRs, but may sometimes work too quickly, eliminating workers before the insecticide can be distributed throughout the entire colony. One promising approach is to use pheromones (compounds produced by a species that regulate their own behaviour) as “biopesticides” to disrupt the reproduction by the queen (O’Dowd et al. 1999). Baits should be designed with the foraging strategies of the specific ant species in mind. Determining the preferred size, type and dispersal pattern of the bait is an important step. Nesting, foraging and behavioural traits of the ant should all be taken into consideration. The use of appropriately designed baits is needed to reduce the cost of toxin use to native ant populations and non-target fauna (McGlynn, 1999). Please follow this link for more detailed information on the management of the yellow crazy ant compiled by the ISSG. Informations on Anoplolepis gracilipes has been recorded for the following locations. Click on the name for additional informations. ABC Online, 2005. Christmas Island, Yellow Crazy Ants. Summary: AntWeb illustrates ant diversity by providing information and high quality color images of many of the approximately 10,000 known species of ants. AntWeb currently focusses on the species of the Nearctic and Malagasy biogeographic regions, and the ant genera of the world. Over time, the site is expected to grow to describe every species of ant known. AntWeb provides the following tools: Search tools, Regional Lists, In-depth information, Ant Image comparision tool PDF field guides maps on AntWeb and Google Earth and Ant genera of the world slide show. Commonwealth of Australia. 2006a. Threat abatement plan to reduce the impacts of tramp ants on biodiversity in Australia and its territories, Department of the Environment and Heritage, Canberra. Summary: This plan establishes a national framework to guide and coordinate Australia�s response to tramp ants, identifying the research, management, and other actions necessary to ensure the long term survival of native species and ecological communities affected by tramp ants. It identifies six national priority species as an initial, but flexible, list on which to focus attention. They are the red imported fi re ant (Solenopsis invicta), tropical fire ant (S. geminata), little fire ant (Wasmannia auropunctata), African big-headed ant (Pheidole megacephala), yellow crazy ant (Anoplolepis gracilipes), and Argentine ant (Linepithema humile). Commonwealth of Australia. 2006b. Background document for the threat abatement plan to reduce the impacts of tramp ants on biodiversity in Australia and its territories, Department of the Environment and Heritage, Canberra. Summary: This background document to the Threat abatement plan to reduce the impacts of tramp ants on biodiversity in Australia and its territories provides supporting information on a range of issues such as tramp ant biology, population dynamics, spread, biodiversity impacts and management measures. Haines, I. H. and Haines, J. B. 1978. Pest status of the crazy ant, Anoplolepis longipes (Jerdon) (Hymenoptera: Formicidae), in the Seychelles. Bull. Entomol. Res. 68: 627-638. Haines, I. H. and Haines, J. B. 1979. Residual sprays for the control of the crazy ant Anoplolepis longipes (Jerd.) in the Seychelles. Pesticide Science 10: 201-206. Haines, I. H. and Haines, J. B. 1979. Toxic bait for the control of Anoplolepis longipes (Jerdon) (Hymenoptera: Formicidae) in the Seychelles. III. Selection of toxicants. Bulletin of Entomological Research 69: 203-211. Haines, I. H., Haines, J. B. and Cherrett, J. M. 1994. The impact and control of the Crazy ant, Anoplolepis longipes (Jerd. ), in the Seychelles. pp. 206�218 in Williams, D. F. (ed. ), Exotic ants. Biology, impact, and control of introduced species. Westview, Boulder, CO.
Harris, R.; Abbott, K.; Barton, K.; Berry, J.; Don, W.; Gunawardana, D.; Lester, P.; Rees, J.; Stanley, M.; Sutherland, A.; Toft, R. 2005: Invasive ant pest risk assessment project for Biosecurity New Zealand. Series of unpublished Landcare Research contract reports to Biosecurity New Zealand. BAH/35/2004-1. Summary: The invasive ant risk assessment project, prepared for Biosecurity New Zealand by Landcare Research, synthesises information on the ant species that occur in New Zealand (native and introduced species), and on invasive ants that pose a potential threat to New Zealand. There is a great deal of information in this risk assessment on invasive ant species that is of global interest, including; biology, distribution, pest status, control technologies. The assessment project has five sections.1) The Ants of New Zealand: information sheets on all native and introduced ants established in New Zealand 2) Preliminary invasive ant risk assessment: risk scorecard to quantify the threat to New Zealand of 75 ant species. 3) Information sheets on invasive ant threats: information sheets on all ant species scored as medium to high risk (n = 39). 4) Pest risk assessment: A detailed pest risk assessment for the eight species ranked as having the highest potential risk to New Zealand (Anoplolepis gracilipes, Lasius neglectus, Monomorium destructor, Paratrechina longicornis, Solenopsis geminata, Solenopsis richteri, Tapinoma melanocephalum, Wasmannia auropunctata) 5) Ranking of high risk species: ranking of the eight highest risk ant species in terms of the risks of entry, establishment, spread, and detrimental consequences. Harris, R.J. & Barker, G. (2007). Relative risk of invasive ants (Hymenoptera: Formicidae) establishing in New Zealand. New Zealand Journal of Zoology 34: 161-178. Summary: The eradication project in NE Arnhem Land is a collaboration between Dhimurru Land Management Aboriginal Corporation, CSIRO, Alcan Gove, Department of Environment and Heritage, Northern Territory Government, Indigenous Land Corporation and the Northern Land Council. The project which began in 2004, is expected to last for 4 years. The yellow crazy ant eradication project in northeast Arnhem Land is the largest eradication project for this ant on mainland Australia. In the interest of sharing knowledge of invasive ant management, Dr. Ben Hoffmann has provided a brief project description as well as the project protocols here for public use. The project protocols are dynamic, and as such are updated from time to time as new knowledge is obtained or as requirements change. Holway, D.A., Lach, L., Suarez, A.V., Tsutsui, N.D. and Case, T.J. 2002. The Causes and Consequences of Ant Invasions, Annu. Rev. Ecol. Syst. 33: 181-233. Krushelnycky, P.D., Loope, L.L. and Reimer, N.J. 2005. The Ecology, Policy, and Management of Ants in Hawaii, Proc. Hawaiian Entomol. Soc. 37. Lewis, T., Cherrett, J. M., Haines, I., Haines, J. B. and Mathias, P. L. 1976. The crazy ant (Anoplolepis longipes (Jerd.) (Hymenoptera, Formicidae)) in Seychelles, and its chemical control. Bull. Entomol. Res. 66: 97-111. McGlynn, T.P. 1999. The Worldwide Transfer of Ants: Geographical Distribution and Ecological Invasions, Journal of Biogeography 26(3): 535-548. McGregor, A. J. and Moxon, J. E. 1985. Potential for biological control of tent building species of ants associated with Phytophthora palmivora pod rot of cocoa in Papua New-Guinea. Annals of Applied Biology 107(2): 271-278. Ness, J. H and Bronstein, J. L. 2004. The Effects of Invasive Ants on Prospective ant Mutualists, Biological Invasions 6: 445-461. O Dowd, D. J. 1999. Crazy ant attack. Wingspan 9(2): 7. O�Dowd, D.J., Green, P.T. and Lake, P.S. 1999. Status, Impact, and Recommendations for Research and Management of Exotic Invasive Ants in Christmas Island National Park. Centre for the Analysis and Management of Biological Invasions: Clayton (Victoria, Australia). O Dowd, D. J., Green, P. T. and Lake, P. S. 1999. Status, impact, and recommendations for research and management of exotic invasive ants in Christmas Island National Park. Darwin, Northern Territory, Environment Australia: 50 pp, 8 figures, 2 plates. O�Dowd, D. J., Green, P. T. and Lake, P. S. 1999. Status, Impact, and Recommendations for Research and Management of Exotic Invasive Ants in Christmas Island National Park. Report to Environment Australia. Oi, D.H., Vail, K.M. and Williams, D.F. 2000. Bait distribution among multiple colonies of Pharaoh ants (Hymenoptera: Formicidae), Journal of Economic Entomology 93(4): 1247�1255. Pacific Ant Prevention Programme, March 2004. Pacific Invasive Ant Group (PIAG) on behalf of the IUCN/SSC Invasive Species Specialist Group (ISSG). Summary: A proposal prepared for the Pacific Plant Protection Organisation and Regional Technical Meeting For Plant Protection. This plan aims to prevent the red imported fire ant and other invasive ant species with economic, environmental and/or social impacts, entering and establishing in or spreading between (or within) countries of the Pacific Region. Rao, N. S. and Veeresh, G. K. 1990. Management of crazy ant, Anoplolepis longipes (Jerdon). Indian J. Plant Prot. 18: 105-8. Reimer, N. J. 1994. 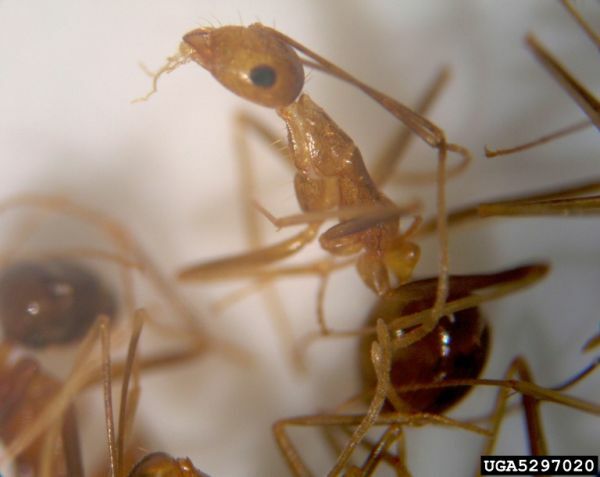 Distribution and impact of alien ants in vulnerable Hawaiian ecosystems. In Exotic ants: biology, impact, and control of introduced species. Williams, D. F. (ed) Boulder, Colorado, Westview Press: 11-22. Sarnat, E. M. (December 4, 2008) PIAkey: Identification guide to ants of the Pacific Islands, Edition 2.0, Lucid v. 3.4. USDA/APHIS/PPQ Center for Plant Health Science and Technology and University of California � Davis. Summary: PIAkey (Pacific Invasive Ant key) is an electronic guide designed to assist users identify invasive ant species commonly encountered in the Pacific Island region. The guide covers four subfamilies, 20 genera and 44 species. The primary tool offered by PIAkey is an interactive key designed using Lucid3 software. In addition to being fully illustrated, the Lucid key allows users to enter at multiple character points, skip unknown characters, and find the most efficient path for identifying the available taxa. Each species is linked to its own web page. These species pages, or factsheets, are linked to an illustrated glossary of morphological terms, and include the following seven sections: 1) Overview of the species; 2) Diagnostic chart illustrating a unique combination of identification characters; 3) Comparison chart illustrating differences among species of similar appearance; 4) Video clip of the species behavior at food baits (where available); 5) Image gallery that includes original specimen images and live images (where available); 6) Nomenclature section detailing the taxonomic history of the species, and 7) Links and references section for additional literature and online resources. Slip, D. J., 2002. Control of the invasive exotic yellow crazy ant (Anoplolepis gracilipes) on Christmas Island, Indian Ocean. In Turning the tide: the eradication of invasive species: 406 - 414 IUCN SSC Invasive Species Specialist Group. IUCN. Gland. Switzerland and Cambridge. UK. Stanaway, M. A., Zalucki, M. P., Gillespie, P. S. and Rodriquez, C. M. 2001. Pest risk assessment of insects in sea cargo containers. Australian Journal of Entomology 40: 180-192. Stanley, M. C. 2004. Review of the efficacy of baits used for ant control and eradication. Landcare Research Contract Report: LC0405/044. Prepared for: Ministry of Agriculture and Forestry. Veeresh, G. K. 1987. Pest status of crazy ant Anoplolepis longipes (Jerdon) in Karnataka, India, and causes for its outbreak. In Chemistry and biology of social insects. J. Eder and H. Rembold. Munich, Peperny: 667-668. Veeresh, G. K. and Gubbaiah 1984. A report on the Crazy ant (Anoplolepis longipes Jerdon) menace in Karnataka. J Soil Biol Ecol 4: 65-73. Walker, K. 2006. Yellow crazy ant (Anoplolepis gracilipes) Pest and Diseases Image Library. Updated on 29/08/2006 12:02:55 PM. Way, M. J. 1953. The relationship between certain ant species with particular reference to biological control of the coreid, Theraptus spp. Bull. Entomol. Res. 44: 669-691. Way, M. J. and Khoo, K. C. 1992. Role of ants in pest management. Annu. Rev. Entomol. 37: 479-503. Williams, D. F. 1994. Exotic ants: biology, impact, and control of introduced species. Westview Press, Boulder, Colorado. Baker, G. L. 1976. The seasonal life cycle of Anoplolepis longipes (Jerdon) (Hymenoptera: Formicidae) in a cacao plantation and under brushed rain forest in the northern district of Papua New Guinea. Insectes Soc. 23: 253-261. Summary: Cette �tude porte sur les relations comp�titives entre trois esp�ces ainsi que sur les facteurs li�s � leur succ�s dans l invasion des milieux. Bos, M.M., Tylianakis, J.M., Steffan-Dewenter, I.S. & Tscharntke, T. (2008). The invasive Yellow Crazy Ant and the decline of forest ant diversity in Indonesian cacao agroforests. Biological Invasions 10:1399�1409. Brown, E. S. 1959. Immature nutfall of coconuts in the Solomon Islands, I. Distribution of nutfall in relation to that of Amblypelta and of certain species of ants. Bull. Entomol. Res. 50: 97-133, plates 2 & 3. Brown, E. S. 1959. Immature nutfall of coconuts in the Solomon Islands, II: Changes in ant populations and their relation to vegetation. Bull. Entomol. Res. 50: 523-558. Bruhl, C.A. & Eltz, T. (2009). Fuelling the biodiversity crisis: species loss of ground-dwelling forest ants in oil palm plantations in Sabah, Malaysia (Borneo). Biodiversity and Conservation, in press. Convention on Biological Diversity. 2003. Pilot Assessments: The Ecological and Socio-Economic Impact of Invasive Alien Species on Island Ecosystems. Subsidiary Body on Scientific, Technical and Technological Advice (Ninth meeting: Item 7.1 of the provisional agenda, Montreal, 10-14 November 2003). Feare, C. 1999. Ants take over from rats on Bird Island, Seychelles. Bird Conservation International 9: 95-96. Fellowes, J. R. 1994. Community structure of Hong Kong ants. Les Insectes Sociaux. 12th Congress of the International Union for the Study of Social Insects, Paris, Sorbonne, 21-27 August 1994. A. Lenoir, G. Arnold and M. Lepage. Paris, Universit� Paris Nord: 421. Fluker, S. S. 1969. Sympatric associations among selected ant species and some effects of ants on sugarcane mealybugs in Hawaii. Ph.D. thesis, University of Hawaii, 96 pp. Fluker, S. S. and Beardsley, J. W. 1970. Sympatric associations of three ants: Iridomyrmex humilis, Pheidole megacephala, and Anoplolepis longipes in Hawaii. Ann. Entomol. Soc. Am. 63: 1290-96. Gerlach, J. (2004). Impact of the invasive crazy ant Anoplolepis gracilipes on Bird Island, Seychelles. Journal of Insect Conservation 8: 15-25. Gillespie, R. and Reimer, N. 1993. The effect of alien predatory ants on Hawaiian endemic spiders. Pacific Science 47(1): 21-33. Gillespie, R.G. and Reimer, N. 1993. The Effect of Alien Predatory Ants (Hymenoptera: Formididae) on Hawaiian Endemic Spiders (Araneae:Tetragnathidae). Pacific Science 47(1) 21-33. Green, P. T., O Dowd, D. J. and Lake, P. S. 1999. Alien ant invasion and ecosystem collapse on Christmas Island, Indian Ocean. Aliens 9: 2-4. Greenslade, P. J. M. 1971. Phenology of three ant species in the Solomon Islands. J. Aust. Entomol. Soc. 10: 241-252. Greenslade, P. J. M. 1972. Comparative ecology of four tropical ant species. Insect. Soc. 19: 195-212. Greenslade, P. J. M. and Greenslade, P. 1977. Some effects of vegetation cover and disturbance on a tropical ant fauna. Insectes Soc. 24: 163-182. Haines, I. H. and Haines, J. B. 1978. Colony structure, seasonality and food requirements of the crazy ant, Anoplolepis longipes (Jerd. ), in the Seychelles. Ecol. Entomol. 3: 109-118. Hardy, D. E. 1979. An ecological survey of Puaaluu Stream. Part III. Report on a preliminary entomological survey of Puaaluu Stream, Maui, Coop. Nat. Park Resources Study Unit. Univ. of Hawaii, Manoa. Tech. Rept. 27: 34-39. Hill, M., Holm, K. Vel, T., Shah, N.J. and Matyot, P. 2003. Impact of the introduced yellow crazy ant Anoplolepis gracilipes on Bird Island, Seychelles Biodiversity and Conservation 12(9): 1969 � 1984. Jourdan, H., Mille, C. 2006. Les invert�br�s introduits dans l archipel n�o-cal�donien : esp�ces envahissantes et potentiellement envahissantes. Premi�re �valuation et recommandations pour leur gestion. In M.-L. Beauvais et al. (2006) : Les esp�ces envahissantes dans l�archipel n�o-cal�donien, Paris, IRD �ditions, 260 p.+ c�d�rom. Summary: Cette synth�se sur les invert�br�s envahissants et potentiellement envahissants dans l archipel cal�donien a �t� r�alis�e dans le cadre d une expertise coll�giale men�e par l IRD. Lumsden, L., Silins J., and Schulz, M. 1999. Population dynamics and ecology of the Christmas Island Pipistrelle, Pipistrellus murrayi, on Christmas Island. Heidelberg, Victoria, Australia, Arthur Rylah Institute for Environmental Research, Department of Natural Resources and Environment: 99. Majer, J. D. 1993. Comparison of the arboreal ant mosaic in Ghana, Brazil, Papua New Guinea and Australia - its structure and influence on arthropod diversity. In Hymenoptera and Biodiversity. J. LaSalle and I. D. Gauld. Wallingford, UK, CAB International: 115-141. Maschwitz, U., Fiala, B. and Dolling, W. R. 1987. New trophobiotic symbioses of ants with South East Asian bugs. Journal of Natural History 21(5): 1097-1108. Rajagopal, D. 1984. Observations on the natural enemies of Odontotermes wallonensis (Wasmann) (Isoptera: Termitidae) in South India. J. Soil Biol. Ecol. 4: 102-107. Rajagopal, D. and Musthak, Ali T. M. 1984. Predatory ants of the mound building termite, Odontotermes wallonensis (Wasmann) with special reference to the predatory behaviour of Leptogenys processionalis (Jerdon). J. Bombay Nat. Hist. Soc. 81: 721-725. Rao, N. S. and Veeresh, G. K. 1991. Nesting and foraging habits of crazy ant Anoplolepis longipes (Jerdon) (Hymenoptera: Formicidae). Environmental Ecology 9(3): 670-677. Rao, N. S. and Veeresh, G. K. 1991. Some observations on the biology and behaviour of crazy ant, Anoplolepis longipes (Jerdon) (Hymenoptera: Formicidae). Entomon. 16(4): 261-267. Rao, N. S., Veeresh, G. K. and Viraktamath, C. A. 1989. Association of crazy ant, Anoplolepis longipes (Jordon) with different fauna and flora. Indian Journal of Ecology 16(2): 205-208. Rao, N. S., Veeresh, G. K. and Viraktamath, C. A. 1991. Dispersal and spread of crazy ant Anoplolepis longipes (Jerdon) (Hymenoptera: Formicidae). Environmental Ecology 9(3): 682-686. Reimer, N. J., Beardsley, J. W. and Jahn, G. 1990. Pest ants in the Hawaiian Islands. Applied myrmecology, a world perspective. In Vander Meer, R. K., Jaffe, K. and Cedeno, A.. Boulder, CO, Westview Press: 40-50. Room, P. M. 1975. Diversity and organization of the ground foraging ant faunas of forest, grassland and tree crops in Papua New Guinea. Australian Journal of Zoology 23: 71-89. Room, P. M. 1980. Insect fauna of oil palm in the Northern Province of Papua New Guinea. Papua New Guinea Agric. J. 31: 1-4. Sakimura and Higa 1967. The long-legged ant, new to pineapple. Pineapple Research Institute News 15: 48-53. Sarnat E.M. and E. P. Economo, 2011. Fiji Ants. The online home of Fiji s Myrmecofauna. Soans, A. B. and Soans, J. S. 1971. A case of intergeneric competition and replacement in the ants Oecophylla smaragdina (Fab.) and Anoplolepis longipes (Jerdon) (Hymenoptera: Formicidae). Journal of the Bombay Natural History Society 68: 289-290. Van der Groot, P. 1916. Verdere onderzoekingen omtrent de oeconomische beteekenis der gramang-mier. Mededeelingen van het Proefstation Midden-Java, Salatiga 22: 1-222. Vander Meer, R. K., Jaffe, K. and Cedeno, A. 1990. Applied Myrmecology: A World Perspective. Boulder, CO, Westview Press. Veeresh, G. K. 1990. Pest ants of India. Applied Myrmecology, A World Perspective. In Vander Meer, R. K., Jaffe, K. and Cedeno, A.. Boulder, CO. 741 pp., Westview Press: 15-24. Way, M. J. and Khoo, K. C. 1989. Relationships between Helopeltis theobromae damage and ants with special reference to Malaysian cocoa smallholdings. J. Plant Prot Trop 6: 1-11. Wetterer, J. K. 1997. Ants On Cecropia in Hawaii. Biotropica 29(1): 128-132. Wetterer, J. K. 1998. Nonindigenous ants associated with geothermal and human disturbances in Hawai i Volcanoes National Park. Pacific Science 52(1): 40-50. Wetterer, J. K. (2005). Worldwide distribution and potential spread of the long-legged ant, Anoplolepis gracilipes (Hymenoptera: Formicidae). Sociobiology 45(1): 77-97. Wilson, E. O. and Taylor, R. W. 1967. The ants of Polynesia (Hymenoptera: Formicidae). Pacific Insects Monog. 14: 1-109. Young, G. R. 1996. The Crazy Ant, Anoplolepis longipes (Jerdon) (Hymenoptera: Formicidae) on coconut palms in New Guinea. Papua New Guinea Journal of Agriculture, Forestry and Fisheries. 39(2): 10-13. Mick Jeffery manages the yellow crazy ant (YCA) control program, on Christmas Island since mid 2002. Micks remarks ... In that period we have conducted an aerial baiting program (2500 hectares of tropical rainforest) and an annual ground baiting program (4 staff, baiting approx 250 ha per year). Every two years we undertake an exhaustive ant distribution and density survey across the entire island which takes 6 persons 3 months to complete. This provides us with incredibly detailed management information on current YCA distributions and densities, effectiveness of previous baiting operations, recovery of land crab fauna, and assists us to prioritise our baiting operations for the next two years. We have a lot of unpublished reports on YCA control, monitoring and research which I can forward to interested people .